MOSCOW (Sputnik), Sofya Grebenkina - Catalan independence activists are willing to have a dialogue with the Spanish government as long as the state first frees Catalan prisoners, Josep-Maria Terricabras, a member of the European Parliament for Esquerra Republicana de Catalunya told Sputnik on Tuesday. 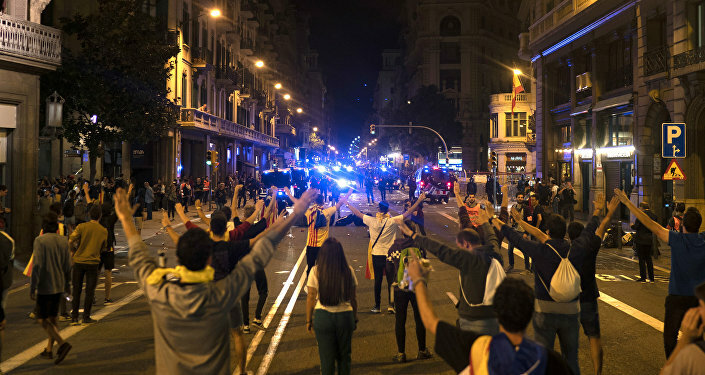 "The protests this weekend had this sense of protest and of demanding that the Spanish government, first of all, frees the political prisoners because it is a scandal … This is the first thing we should solve because it is impossible to have a talk and a dialogue with the government if people are still in prison," Terricabras said. Terricabras noted that until now, despite the Catalans' willingness to talk, there have been no proposals proffered to the regional government by the Spanish state so far on how to initiate the dialogue about the region's desire to become independent. Terricabras added that the independence movement is unlikely to be satisfied with more autonomy after millions of people voted for full independence. "The problem as I see that is not that Catalonia wants more autonomy that is not our point. Our point is that we had one year ago a referendum … We are under terrible circumstances. Over 2,300,000 people voted and 90 percent voted for independence. We have to discuss this. This has been done, this happened, and we cannot simulate that nothing happened," Terricabras said. In commemoration of Catalonia holding the independence referendum on October 1, 2017, around 183,000 people participated in protests, which later descended into riots, in Barcelona and Girona, on Monday. In Girona, protesters attempted to pull down the fence surrounding the Catalan government’s representation, while in Barcelona protesters forced police officers to retreat into the parliament building as they surrounded it. The 2017 referendum resulted in 90 percent of voters supporting Catalonia's secession from Spain. On October 27, 2017, the Catalan government proclaimed the region's independence, but the central Spanish government responded by imposing direct governance over Catalonia just one day later, refusing to accept the vote. The Spanish Supreme Court charged 25 people with sedition, rebellion, embezzlement and other crimes over last year's events. Some of the charged leaders remain in prison, such as Oriol Junqueras, the former vice president of Catalonia.